I call this yarn... "You don't win friends with salad." If you know where this is from - you get 2 points! 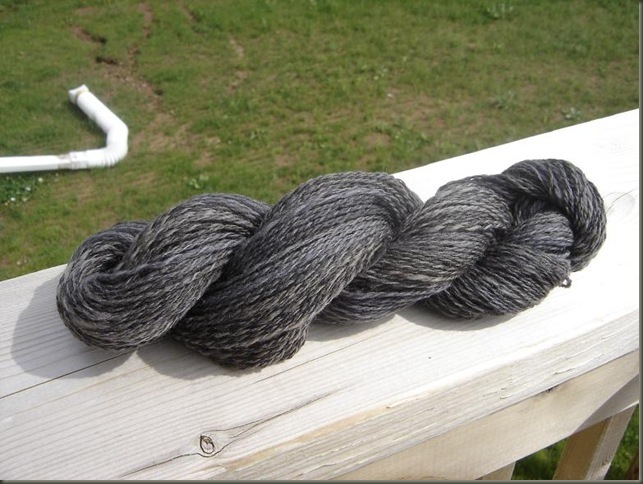 I had originally intended this to be a worsted weight single... but you know how things never go exactly as planned! 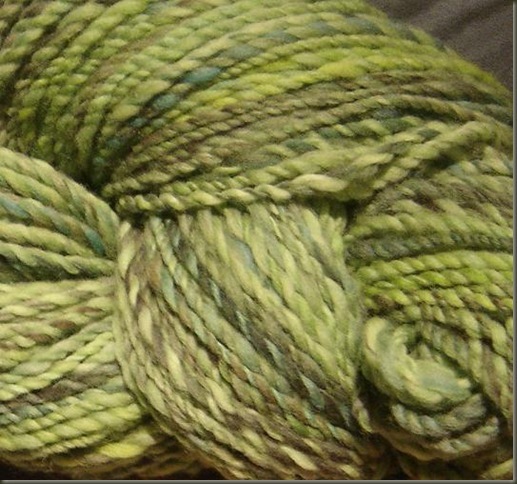 I neglected to take photos of the roving, but it was basically green with splotches of brown, teal blue and yellow. I thought that since I was planning on doing a single, I would gently card it into some fluffy rolags to blend the colors up a bit. Apparently my fat single skills are lacking, because when I held it up to a strand of Malabrigo (which was my sample to match) I felt my single was too uneven. Now quite honestly, I am hard on myself when it comes to this stuff. I bet that if I had just knit it up, the finished product would have been fine. Knitting seems to cover up a multitude of sins, and even out yarns that aren't exactly consistant. 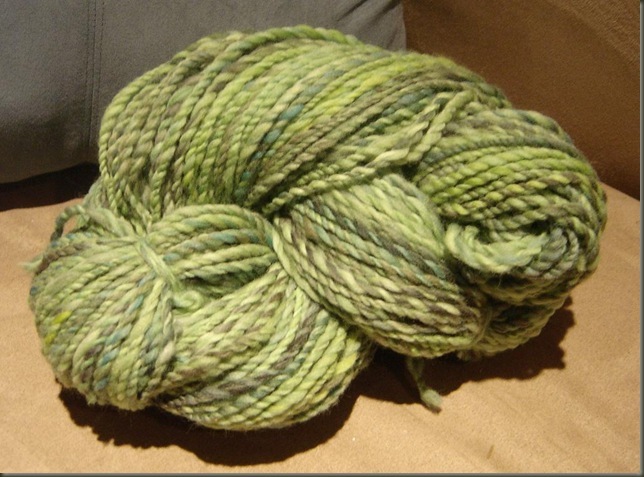 But I got the idea that I could ply the fat single back on itself and get a bulky weight yarn. I had to weigh my options... skinny-cable mittens with light worsted weight yarn, or big-fat-chunky cable mittens. 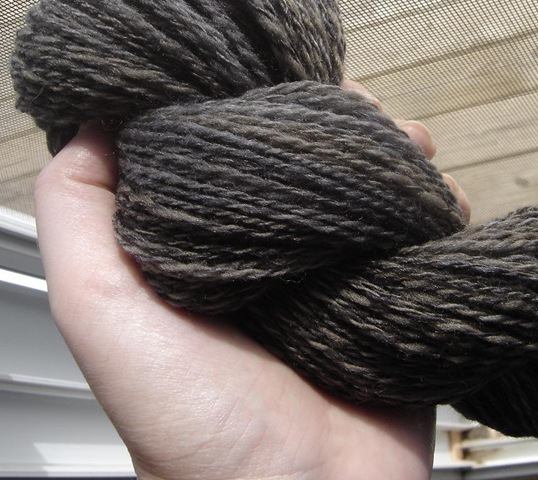 I plied about a 3 foot section back on itself and hummed and hawed. This skein overfilled my Ashford Jumbo bobbins. In fact, I had to do a chunk of it on a regular bobbin, because I had maxxed out the air space around the big bobbin and the darn thing wouldn't turn anymore. 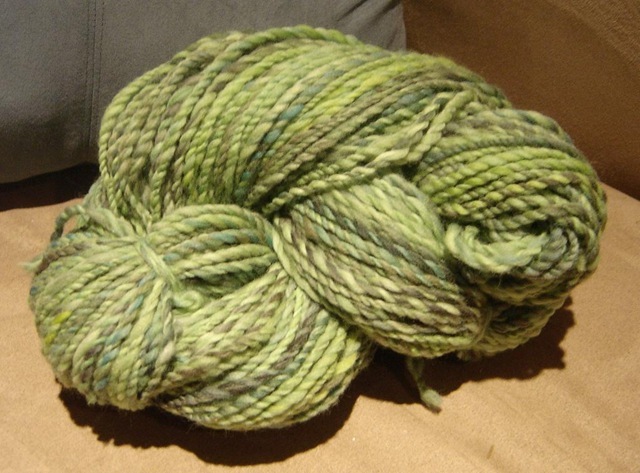 The roving was somewhere between 5.5 and 6 ounces, and the yarn is somewhere around 5 - 6 Wraps per Inch. It looks large like caterpillars, as big as candycanes, the same diameter as a basic ballpoint pen... but it is very lofty and squishable. I am knitting it on size 5 mm needles, and so far it is looking good. The smaller needles for the yarn are making a very nice dense, thick fabric - which should be great for warm winter mittens. Angora and Cashmere - LACE! 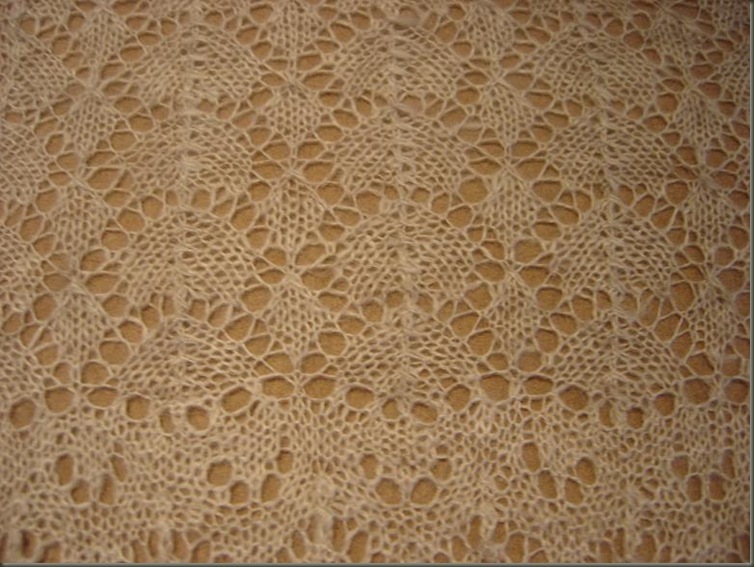 Every time I look through the book Knitted Lace of Estonia, I daydream about each of the patterns... and drool over the intricate and lovely lace patterns. I've knit a few projects already, but someday I imagine I will make every one of them. For this decadent lace yarn, I decided to do the Peacock Tail and Leaf Scarf - both because of the lovely leaves and open style, but also because I could modify the pattern to be narrower, and use less yarn for a finished scarf. I also opted to forego the nupps, both to preserve yarn, and because I figured the fuzziness would obscure them anyways. 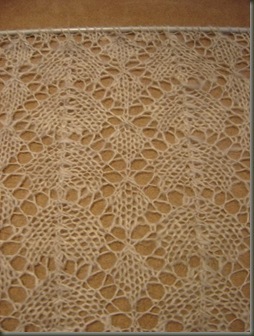 I've worked the first "end" and made it up into the main body of the lace... probably 1/4 of the way. 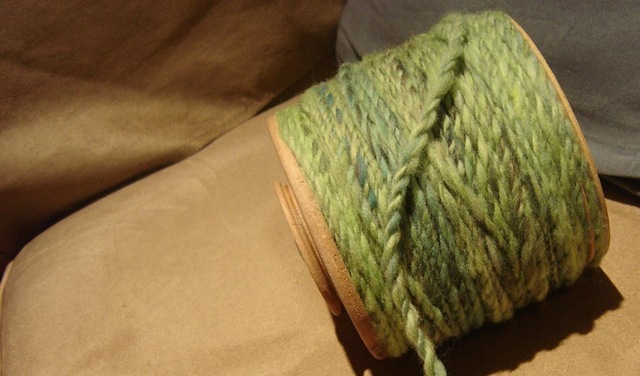 I am quite happy with the light soft halo that is fluffing up as the yarn is manipulated. There were a few "thin" spots which scare me a bit. I took another single and reinforced a couple areas by darning along side the thin strand. I don't think it shows up too badly, and hopefully I kept things loose enough that the areas will block properly also. 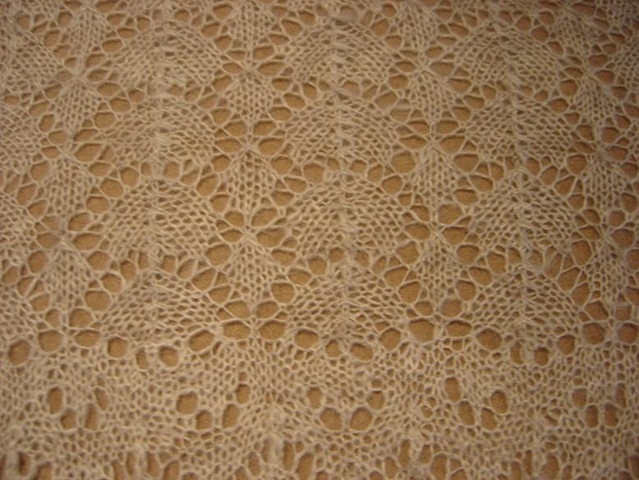 The texture of the completed lace is quite difficult to describe... the yarn itself is very light. You can hardly feel the strand flow through your fingers. 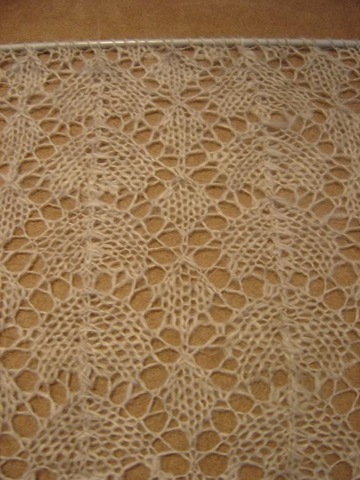 In comparison to the weight of the needles, the already completed section of lace weighs next to nothing! It almost feels as though I'm knitting with air. I know that Angora is very warm, so the finished scarf will have a lot of heat-holding ability, but it will be very very light. I hope it will be as comfortable as it will be beautiful.